athletics | Out of the Box! 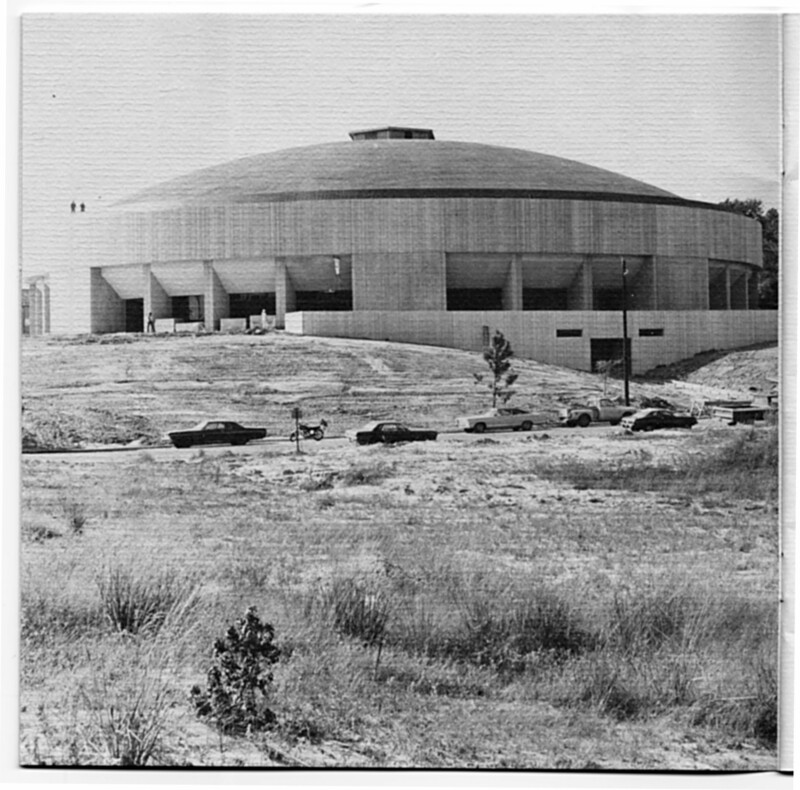 The University Coliseum was completed and opened in December of 1976. Designed as a spectator facility where various sports and special events could be scheduled the coliseum is basically an open arena with a playing/performing court with 5,000 fixed seat and 3,200 other sides with folding bleachers or temporary seating. A circular concourse level surrounds the arena. Designed by Fort Worth Architect Preston M. Garen and constructed by Waco Construction the new Health and Physical Education Building contract was let for $3,589,000 dollars. The new University Coliseum received awards for design excellence and was published in many professional journals. 1. There are 19 sections of seats labeled A through S with 18 entry ways. 2. There are 56 doorways. 7. 24 trash cans that weigh 44 pounds apiece. 8. The press room was in the concourse. 9. The Coliseum contain 11, 752 square feet in the concourse area, 44, 666 square feet outside the concourse area, and about 78, 000 square feet in total. 10. The plastic seats alone are worth $178,000. 12. The glass, called “windowwall” decorates 6, 384 square feet of the Coliseum’s outside walls. It is bronze tinted with the aluminum around the glass having a bronze finish. It remained the University Coliseum until the Texas State University System at its meeting of August 21, 1987, voted to name the coliseum in honor of former regent of the TSUS, Bernard G. Johnson of Houston, Texas. At the December 12, 1987 commencement program Bernard G. Johnson was the commencement speaker. During this commencement Johnson was also awarded an honorary Ph. D, as a Doctor of Philosophy and the University Coliseum was dedicated as the Bernard G. Johnson Coliseum. This year the Bernard G. Johnson Coliseum will celebrate their 40th year of service. In that time changes in the building and the events that are held there have been varied from musical groups, commencements for the University and area high schools, basketball games, volleyball games, hurricane storm shelter, to a new sparkling cooper roof and a brand new floor. The featured photograph is from, “The Presidents Report of 1975-76,” The completed building photograph shows the new building with a grassy area across the street from the building. Today that grassy area is across the street on Bobby K. Marks Drive and Bowers Boulevard and is a parking lot in front with intramural fields in the back. Please come visit the University Archives in room 400 of the NGL to see more about the Bernard G. Johnson Coliseum. Also be sure to visit the Johnson Coliseum for a special exhibit on the history of the building. 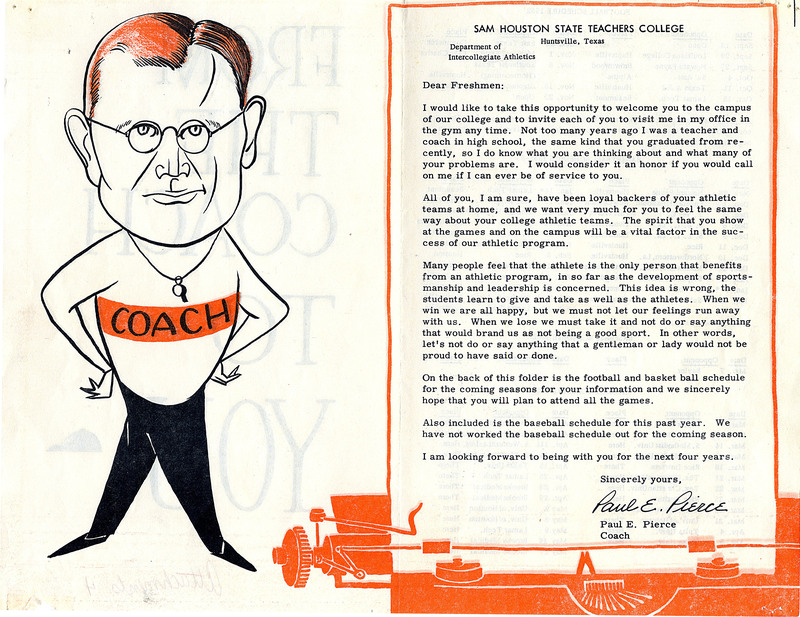 This booklet featured above is called, “From Coach to You,” and was done by new Director of Athletics and football Head Coach Paul “Red” Pierce in 1952 to introduce himself and the athletics program to the freshman students. Coach Pierce came to Sam Houston State in 1952 from his alma mater Sul Ross State Teachers College in Alpine, Texas. 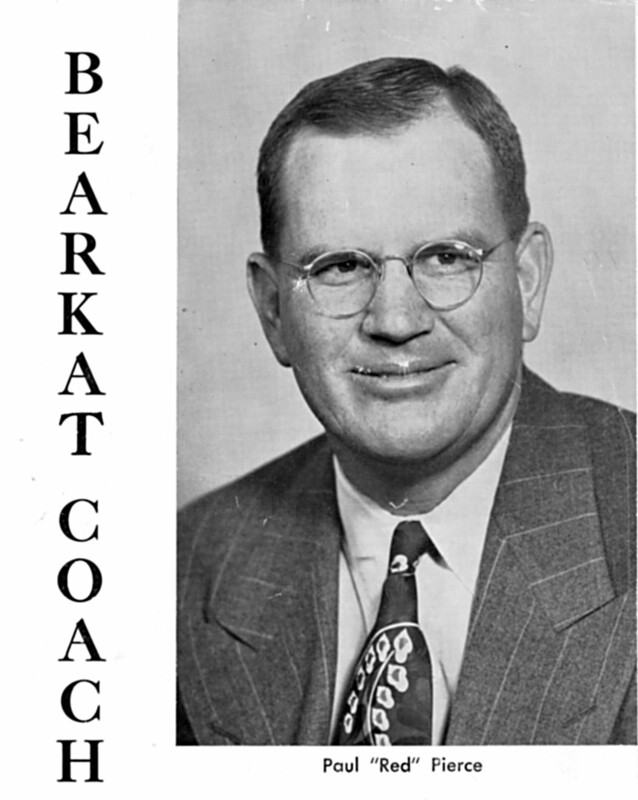 While at Sam Houston State, Red’s BearKats won or tied for four conference championship in 1955, 1956, 1961 and 1964 and played four bowl games. In 1964, the BearKats shared the NAIA National Championship title with Concordia College with a final score of 7-7. The bowl games the Kats won during his tenure as head coach were the Shrimp Bowl, and two Refrigerator Bowls in 1953 & 1956. They also played in the 1958 Christmas Bowl but were upset by Northwestern State. Coach Pierce left Sam Houston State in 1967 to return to Sul Ross State. In 1978 Coach Pierce was inducted into the BearKat Athletics Hall of Honor. This week in the lighter side of 100 years of BearKat football we have a BearKat who really enjoyed the game. The cover of the SHSU Media Guide of 1989 shows All-American Bearkat, “Sackmaster,” Andre Finley, looking ready for another great season of BearKat football. The defensive end from Houston, played 1986-1989, was a senior majoring in criminal justice and the 1989 BearKat team captain. He was also a member of the 1986 Gulf Star Conference championship team. In 2003 he was inducted into the Sam Houston State University Athletic Hall of Honor. 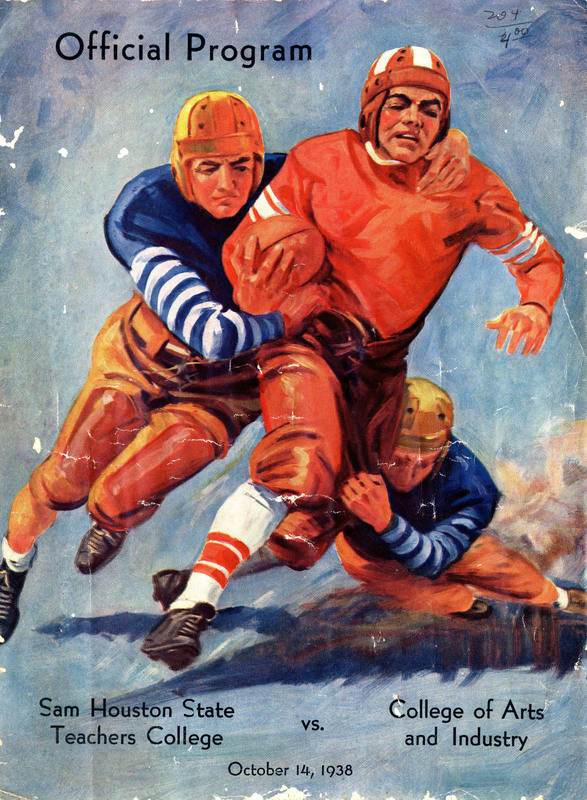 To learn more or see other BearKat football media guides or game programs come visit the University Archives in Room 400 of the Newton Gresham Library. The 100th season of Sam Houston State University’s football program is about to begin on September 5th as the BearKats take on the Texas Tech Red Raiders. On this momentous occasion the Sam Houston State University Archives would like to show the lighter side of BearKat football over the years. 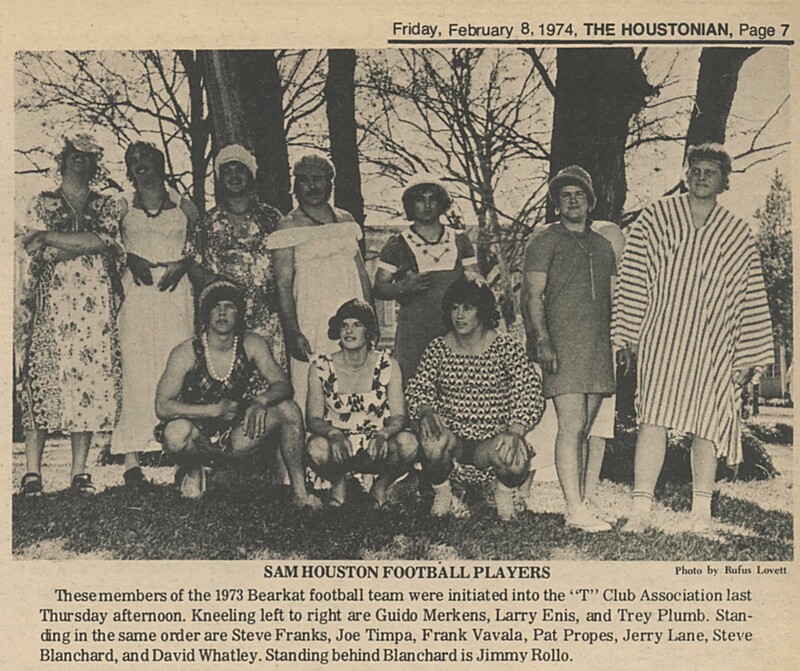 This photograph from the February 8, 1974, The Houstonian, has our hard-hitting Kats showing their softer side for their initiation into the “T Club” Association. The “T Club,” Association is an organization that is made up of men who have earned their letters in the different branches of college sports. The “T” in “T Club” stands for Teachers College. The use of the “T” letters for athletics started in 1923 when the normal schools, including Sam Houston Normal Institute, names were changed to teachers colleges. Today, the “T Club” is called Sam Houston State University Lettermen Association. The University Archives will share lighter moments in BearKat football from the last hundred seasons in the coming weeks. Don Sanders Stadium 10th Year Celebration. The BearKat Baseball team’s first game on February 13th at 6:30 will open their 10th season of playing at the Don Sanders Stadium. Come out and help celebrate this complex’s 10th year of operation. Head over to the SHSU Athletics Department, Don Sanders Stadium 10th Season webpage for information on the history of the stadium and it’s namesake. 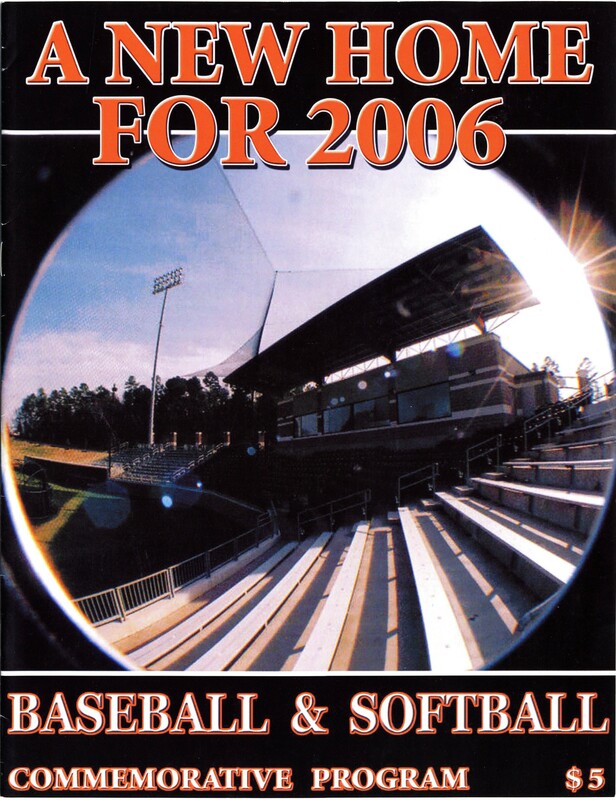 To see this complete 2006 Baseball & Softball Commemorative Program or other materials about SHSU BearKat Baseball come visit the University Archives, room 400, in the Newton Gresham Library. 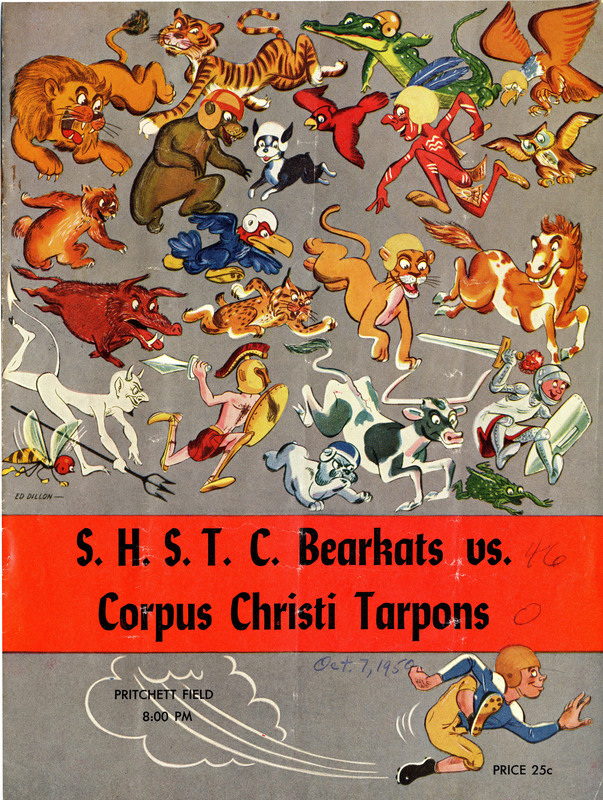 This colorful cover of the official program for the 10/14/1938 football game between SHSTC and the College of Arts and Industry in Kingsville (now Texas A&M at Kingsville) survived for 75 years to become the newest addition to the SHSU University Archives collection of football programs and media guides. 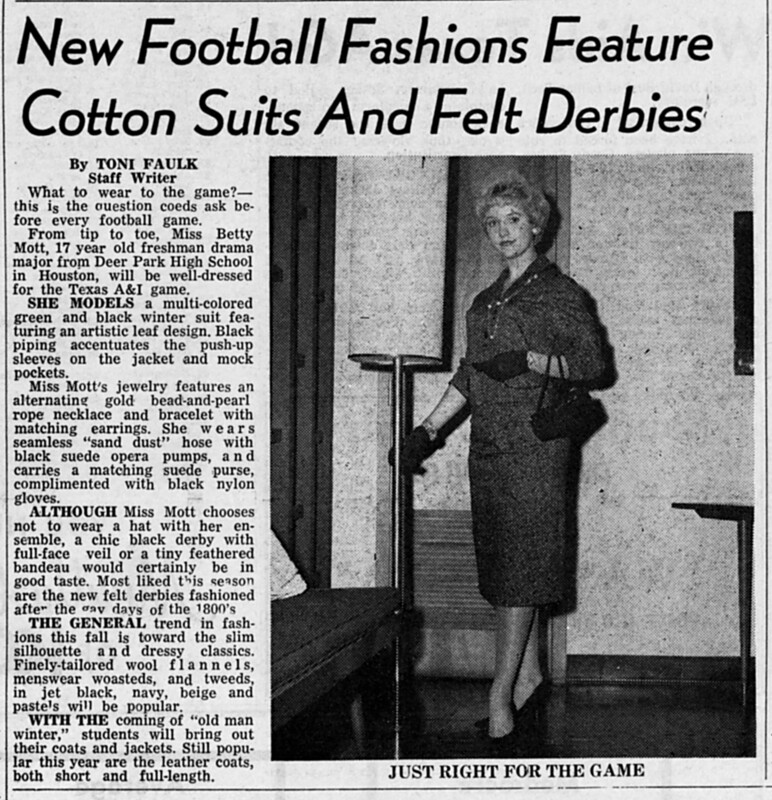 It is also the oldest official football program held by the SHSU University Archives.